Holy Transfiguration Cathedral of Los Angeles regularly holds Divine Liturgies on Saturdays, and on Saturday February 8th, a special blessing was imparted with the presence of the icon. The Rector, Archpriest Alexander Lebedeff presided, co-served by Cathedral clerics Priest Roman Katyshev, and Protodeacon Andre Karobkoff. A full choir was present, prayerfully singing under the direction of Alexei Sokoloff. Before liturgy, the Holy Transfiguration Russian School children had the opportunity to venerate the Icon before beginning their classes. During the service, the faithful slowly filtered in with a total of about 250 worshippers; long lines to venerate the Icon prevailed as people lingered to ask for intercession and consolation from the Theotokos. At the conclusion of Liturgy, a Moleben was served, followed by anointing of the faithful with the myrrh from the icon. Afterwards Father Alexander and Reader Nektary took the Icon into the Classrooms of the Russian School. 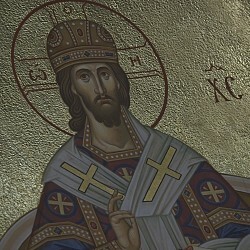 The Icon then traveled to the Serbian Orthodox Church of the Nativity of the Theotokos in Irvine, where it was greeted by the Rector, Priest Blasko Paraklis. It stayed there for Saturday Akathist and Vigil, and Sunday Divine Liturgy, while many worshippers were able to venerate and this Miracle from God and be anointed. It was truly a blessing to have the Hawaiian Myrrh-Streaming Iveron Icon in the Los Angeles area, if even only for a short time.